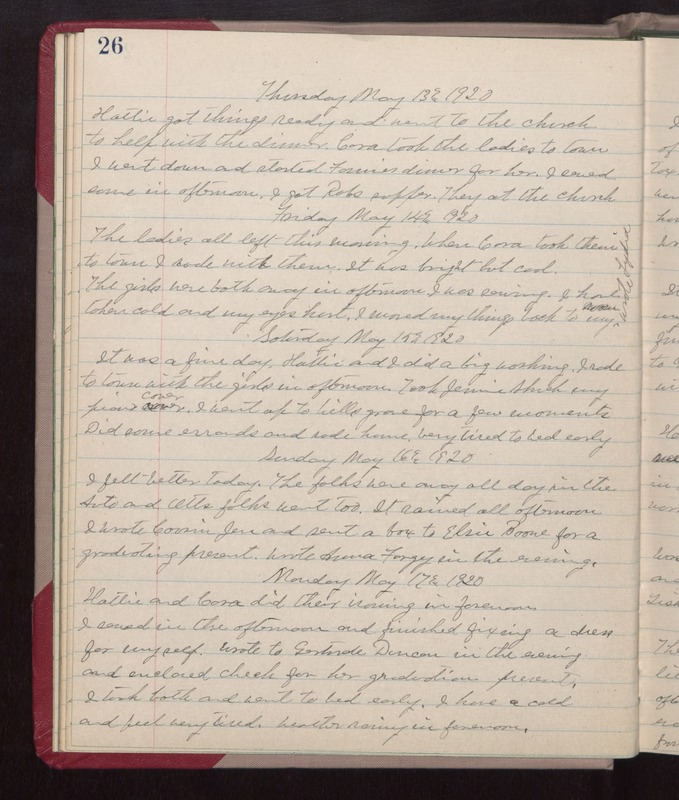 Thursday May 13th 1920 Hattie got things ready and went to the church to help with the dinner. Cora took the ladies to town. I went down and started Fannies dinner for her. I sewed some in afternoon. I got Robs supper. Then at the church. Friday May 14th 1920 The ladies all left this morning. When Cora took them to town I rode with them. It was bright but cool. The girls were both away in afternoon. I was sewing. I had taken cold and my eyes hurt. I moved my things back. Wrote Lydia. Saturday May 14th 1920 It was a fine day. Hattie and I did a big washing. I rode to town with the girls in afternoon. Took Jennie [Shuck?] my piano cover. I went up to Wills grave for a few moments. Did some errands and rode home. Very tied to bed early. Sunday May 16th 1920 I felt better today. The folks were away all day in the Auto and Otts folks went too. It rained all afternoon I wrote cousin Jen and sent a box to Elsie Boone for a graduating present. Wrote Anna Forgy in the evening. Monday May 17th 1920 Hattie and Cora did their ironing in forenoon. I sewed in the afternoon and finished fixing a dress for myself. Wrote to Gertrude Duncan in the evening and enclosed check for her graduation present. I took both and went to bed early. I have a cold and feel very tired. Weather rainy in forenoon.